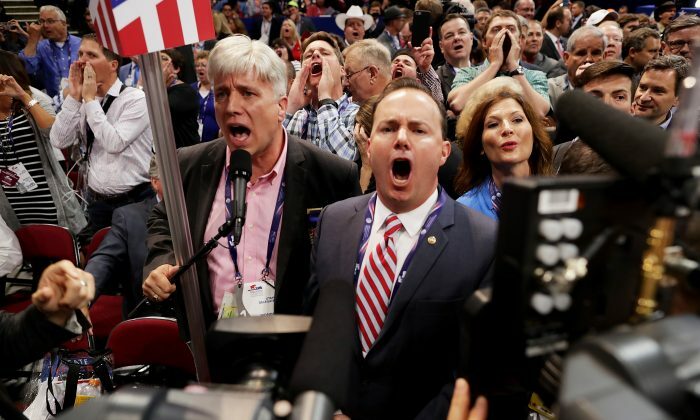 For a few minutes there was chaos on the floor of the Republican National Convention when critics of Donald Trump called for a roll-call vote of the convention rules. The critics of Donald Trump let their voices be heard on the first day of the Republican National Convention in Cleveland, but the motion to vote on the convention rules got bypassed and blocked by the chair of the committee Rep. Steve Womack (R-Ak.). Womack was temporarily replacing Speaker of the House Paul Ryan, and was chosen by the Trump campaign because he’s known for being able to manage tough floor votes. The anti-Trump delegates were hoping to get a roll-call on the convention floor in hopes of changing the rules, allowing the delegates to be unbound and able to vote for whichever candidate they want. Melania Trump Says She’s Her Own Person: Who Is She? The group needed majorities from at least 7 states to force the roll call, and the group claimed that a majority from 9 states signed a motion to force the vote on the rules. After holding a vote by voice on the convention rules, Rep. Steve Womack declared that the delegates had voted in favor of adopting the rules. Womack then left the stage temporarily. After Womack returned to the stage, he called for a second voice count, which was won again by the ‘aye’ vote. He then announced that three states had withdrawn their support from the vote, and the group opposing the rules didn’t have the required seven signatures to call for a full roll-call vote of the delegates. Sen. Mike Lee (R-Ut.) was one of the most aggravated anti-Trump delegates when Womack left the stage. This is only the first day of the convention, and is not likely to be the last time the anti-Trump delegates will get a chance to issue a protest against the nomination of Trump.